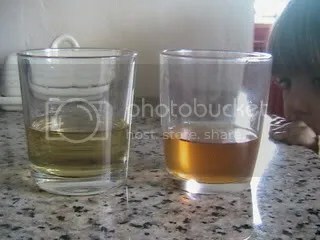 The one the left is the normal cider and the one on the right has been freeze distilled. We had some friends visiting this weekend so what better way to celebrate than with alcohol. I’d been wanting to try this technique of freeze distillation with cider for a while but never got round to it. Basically you put your alcohol in a container then put it in the freezer. All the water freezes and you are left with a higher alcohol content and a stronger flavour. Freeze distillation is a metaphorical term for a process of enriching a solution by partially freezing it and removing frozen material that is poorer in the dissolved material than is the liquid portion left behind. Such enrichment parallels enrichment by true distillation, where the evaporated and recondensed portion is richer than the liquid portion left behind. Part of the reason I did this was that I was not convinced that the cider had much alcohol as it does not taste as if it does. However after the freezing process the change was considerable. It had definatly enhanced the flavour, colour and raised the alcohol content. It really works! Although I did not end up with much compared with the volume that I started with what I ended up with was a much better drink. I am going to try it with the second batch of cider that I made as this was mostly Bramleys and although it’s not as bad as I was led to believe, I think that it could be turned into a far superior drink if distilled. According to Wikapedia this process is illegal in many countries because a number of by-products of fermentation (fusel alcohols), which are mostly removed by heat distillation, tend to accumulate to an unhealthy level in freeze-distilled beverages. From what I understand, this process was very popular among the New England colonies. Barrels of apple wine would be set out in sheds during January and February when the temperatures where blistering cold. And, by first thaw it would be ready to drink. In America this drink is called Apple Jack. Freeze distillation is also refered to as the Mongolian still and is said to have been in use since the 7th century. Awesome.I just recently saw an episode of “Wartime Farm” and they made moonshine on the top of a big kiln. I have been meaning to blog about making wine. Thanks for looking I didn’t see that episode but will try and find it. I’m the same I do a lot more than I blog about I must try and write more of it down.